Our body is a wonderful machine that works perfectly for the vast majority of time, however when things go wrong we can help. Our Physiotherapy team have extensive Post Graduate training in Musculoskeletal assessment and treatment, and all have a minimum of 10 years post graduate clinical experience. We pride our selves on providing you with a diagnosis and treatment plan that is bespoke to your needs. At Great Northern Physiotherapy, we also champion the benefits of expertly applied hands-on manual therapy. 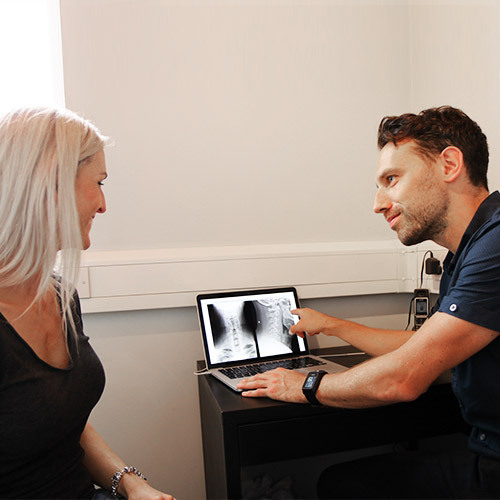 For spinal conditions, our team are trained in complex spinal assessment, manual therapy and management and we use Vimove 2 spinal motion sensor assessment to put real data behind our decision making. In addition to manual therapy we have a number of effective treatments for managing pain and dysfunction. We utilise modern electrotherapy equipment for pain relief, facilitating healing and optimising recovery. Both Phil and Becky have post graduate training in acupuncture and dry needling and regularly use this alongside their Physiotherapy practice. Via a process of specific assessment techniques we are able to select the right treatment technique in order to facilitate the best outcome and restore normal function.